Most construction sites are too dark during workinghours and too bright during nonworking hours. The end result is wasted energy and unsafe lighting conditions. The FLEX SLS Intelligent Control System allows project-wide control of temporary low-voltage LED construction site lighting from a single access point – operate at full power for working hours, low power or off during non-working hours, and notification alert mode for job site situations. With the FLEX SLS Intelligent Control System, optimal lighting conditions for your project are simple and easy to program, manage and reconfigure to meet the ever-changing needs of your construction site. 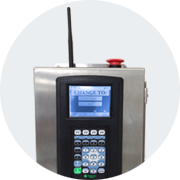 The FIS1 Control Panel is comprised of a graphical user interface and keypad, and a network coordinator. There is a simple to understand manual to take you through every step of the programming process.